This page describes CAN interface basics and provides link to other useful interfaces such as RS232,RS485,RS422,SPI and DigRF. CAN is the short form of Controller Area Network. The design is to make devices communicate to each other without having single host PC. Mainly targeted for microcontroller based applications and widely used in automotive, medical and networking applications. CAN interface is used with CAN bus, it is a differential 2 wire interface. Data communication over CAN uses NRZ encoding for bit encoding. 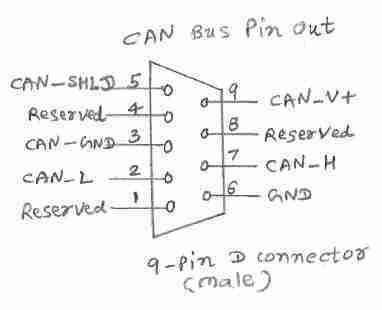 It uses 9 pin D type male connector for all the nodes to communicate on CAN bus. Following figure and table depicts the same.